The winter winds bring storms to the lands of Rokugan, covering the Emerald Empire with sleet and ice. A thick blanket of snow prevents travel, and the armies of the land rest their weapons until the gentle rains of spring thaw the Empire. But winter is not filled with peace and harmony. In the court of the Emperor, the most powerful courtiers, diplomats bushi and shugenja have gathered, hoping to seize the Emperoro's favour for the coming year. Each move is delicately planned, each machination is carefully designed, and the winter snow covers treachery and deceit. Learn the inner workings of the Empire - from the secrets of the court and its members to the history of the Imperial Hantei and their house. Discover the plans and schemes of the Seven Clans and the schools of the Seppun and Otomo families. Look into the secret past of two of Rokugan's most famous samurai: Nayushi Kachiko and Doji Hoturi. 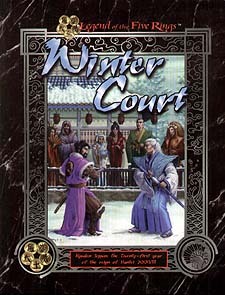 Winter Court is filled with the history and culture of a thousand years. Etiquette, intrigue and glory await you, as well as a danger as real as any threat of the Shadowlands, and far more subtle. Each year the Emerald Empire changes, as power struggles and preparations for the spring cause upheavals within the Seven Clans. Rokugna's future may depend on the actions of those fortunate enough to gain an invitation to the Emperor's Court. Are you brave enough to change the Empire?